A photo of Amilcar López Pérez. Photo by Daniel Arauz. 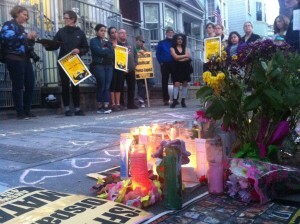 Neighbor and civil rights attorney, Bill Simpich, conducted the vigil along with neighbor Jorge Hari Cal. López-Pérez’s body will be taken to Guatemala once the autopsy is finalized in the coming days, said Simpich. The second roommate was also scared to give his statement when detectives showed up at his house because it was starkly different from the police account of the facts. “If these cops acted in this manner and allegedly say they were attacked. It’s not true. If later, we make a statement against that, what will become of us?” he asked those gathered in front of the sidewalk memorial. “We are overwhelmed, stressed out, we can’t sleep,” he said adding that López-Pérez was not attempting to steal the bicycle. One of López-Pérez’s roommates said that he had to break the news to López-Pérez family in Guatemala, who are from indigenous descent. López-Pérez was from Chiquimula, and it’s very possible that Spanish was his second language, he said. López-Pérez had enrolled in English classes at CCSF a month and a half before he was killed, said one of his roommates. He was the oldest of three brothers and was the main economic supporter of his family. “He had just sent enough money to buy a tractor to plow the ground,” he said. López-Pérez often worked 12 to 14 hour shifts to cover his multiple construction and restaurant jobs. 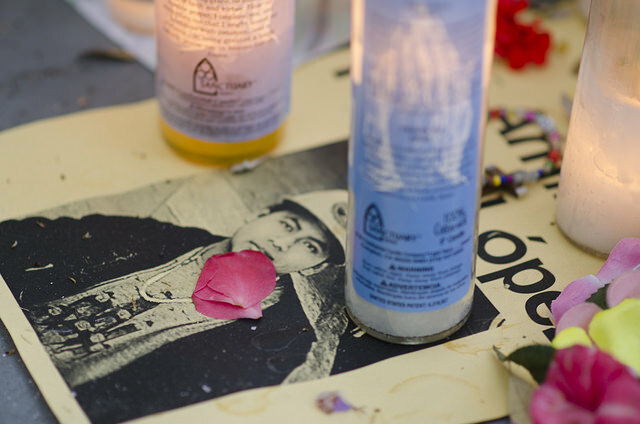 Neighbors expect López-Pérez’s father to visit in the coming weeks and to work with a steering committee that is in the works to file a lawsuit against the officers that killed him. Police have identified the two plainclothes officers as Craig Tiffe and Eric Reboli. Independent of the vigil, a march and rally was organized and attended by approximately 40 people who gathered at 16th and Mission. As the group made their way towards the Mission Police Station chanting “How do you spell murder? SFPD” and “Who killed Amilcar? SFPD,” riot police and vans quickly followed them. The group reached the 24th Street BART Plaza and quickly headed towards Folsom Street, where they retold the story of López-Pérez. The group marched back to the BART plaza to wrap up the march. Back at the vigil, a fundraising effort to help with expenses was said to be in the works to set up a bank account “to make sure the money gets to the right people,” said Simpich, referring to López-Pérez’s family. Regardless, a glass bowl was passed around to start the collection. “We hope to do as much as we can to move forward with the plan, to get justice for Amilcar, for the fallen, for everyone,” said Bill Simpich, a neighbor and civil rights attorney who is actively working with neighbors to create a steering committee. A facebook public group has been created as a means to establish a central calendar.